13 Mar 2013, 2:16 p.m.
‘Art and Film have a troubled and incestuous history’ writes Douglas Fogle in his articleCinema is Dead, Long Live the Cinema (Frieze Magazine, Issue 29, 1996). Fogle’s article looks at the relationship between Art and Cinema while reviewing a series of exhibitions that have taken place to mark one hundred years of filmmaking including an exhibition entitled ‘Spellbound’ at the Hayward Gallery. The exhibition attempts to fuse the mediums of installation art and film together by inviting artists and filmmakers alike to try their hand at crossover projects with contributors including Damien Hirst, Douglas Gordon (with his piece “24 hour Psycho”), Terry Gilliam and Steve McQueen. Fogle is less than complimentary about the success of these projects and insinuates that the increasing importance and seductiveness of cinema has meant that the medium already plays a major role in contemporary art and that crossover projects that attempt to glorify this importance suffer as a consequence. There is a strong argument that contemporary film is the essential medium for creative expression in our culture today. Indeed Fogle states quite candidly that a lot of static art has paled in comparison with the dazzling visual edifices created by filmmakers such as Orson Welles. ‘The world has rocked to the rhythm of 24 frames per second for over a century and hasn’t looked back’ he says. However, film still remains a difficult medium to master. Fogle points out that there are apparent gaps between the moving image and static art and that ‘visual artists trip over cinematic land-mines when crossing into film’. Film, Fogle maintains, is still alarmingly evasive despite its alluring qualities. It is interesting comparing this article (written in 1996) with Christopher Kenneally’s 2013 documentary Side by Side, which looks at the advent of digital film images and the decline of celluloid. The exhibitions the article reviews seek to highlight how far film has come since its invention in the 1890s and the important and dominant role it plays in contemporary art. However, film itself has developed remarkably since its centenary celebrations. The introduction of digital film has begun to supersede its photochemical counterpart. This is due in part to its accessibility. Side by Side seeks to illuminate this transition in optical media by interviewing many of the world’s leading filmmakers and cinematographers and noting their preferred methods. It is clear to many though, even to those filmmakers who prefer traditional methods of film practice, that digital is fast becoming the dominant medium. Accessibility is democracy, the film points out, and democracy is becoming vital to the arts. Visual art is as unsentimental as the high street in many respects. Nostalgia is saved for the museums, the galleries and the antique auction houses. The supersedure of art forms and the beguiling nature of more accessible optical media is the subject of my short film,The Lanternist. Lanternists, who were sometimes referred to as Savoyards or Galantys, were traditional small-time visual entertainers in the early 19th century. They would travel between villages and towns putting on magic lantern displays in public places or in the houses of the wealthy. However, their trade began to decline towards the end of the century, due in part to the mass-production of magic lanterns and slides which made it possible for families to organise private lantern displays in their own homes. 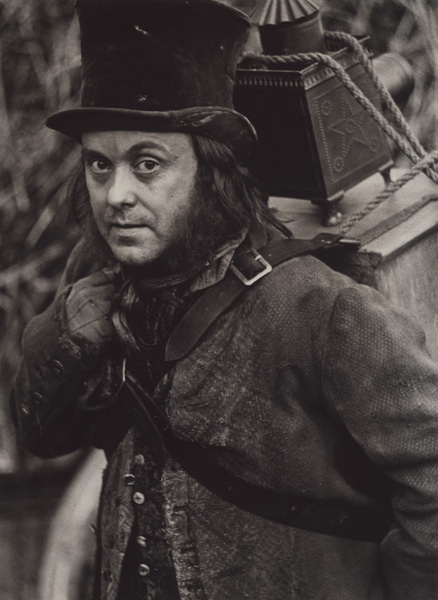 Partly inspired by Alex Norton’s brilliant turn as an itinerant lanternist in Bill Douglas’ film ‘Comrades’, my short film portrays the galanty in a less than fortuitous light. However, unlike Bill’s Lanternist, who through the course of ‘Comrades’ takes on many different guises in order to tell the parallel stories of the history of pre-cinema and the struggles of the Tolpuddle Martyrs and who eventually appears as a successful showman in the final reel, the Lanternist in my film is tortured by the redundancy of his trade and desperately wanders the fringes of society searching for an audience. He engages in crazed and ritualistic dances as part of a defunct show that he performs to no one. He cuts a wraith-like figure walking a lonely pilgrimage. Along the way he finds discarded objects that reflect his own futility. I was inspired largely by Bill’s use of the Lanternist as a metaphorical figure in order to give his film a more harrowing visual, cultural and social context. 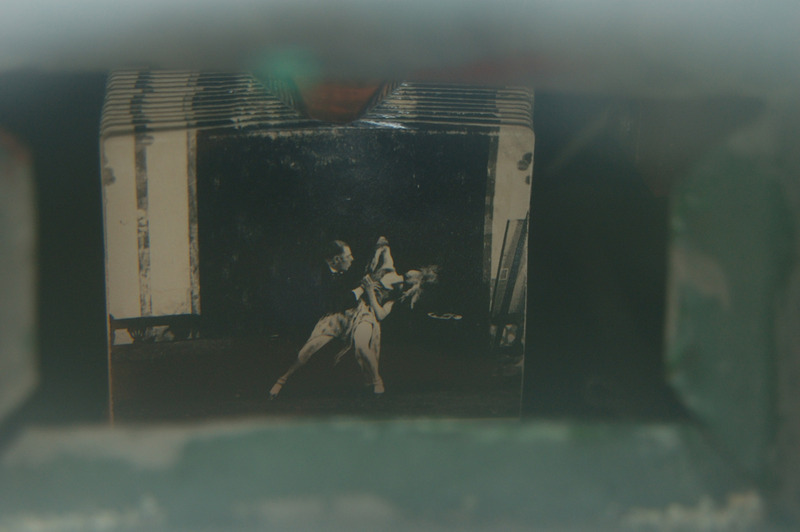 In the final shot of my film I have included a Mutoscope display, that can be found in the Centre. The Mutoscope, like the Magic Lantern before it are all part of the progression in optical entertainment that has led to contemporary cinema as we know it today (my film is shot in digital). We should celebrate this progression, and indeed the progression of all art forms, and while innovation may be ephemeral it is vital to our culture. However, there are many Lanternists left behind along the way.